This article is about the town in South Africa. For the unincorporated place in Delaware, see Pinetown, Delaware. For the community in North Carolina, see Pinetown, North Carolina. 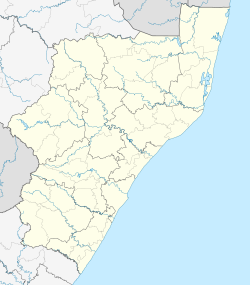 Pinetown is a town that is part of the eThekwini Metropolitan Municipality, just inland from Durban in KwaZulu-Natal, South Africa. Pinetown is situated 16 km west of Durban at an elevation of 1,000 to 1,300 feet (305 to 395 m). Pinetown was named after the governor of Natal, Sir Benjamin Pine. The town was established in 1850 around the Wayside Hotel, itself built in 1849 along the main wagon route between Durban and Pietermaritzburg. During the Second Boer War, the British built a concentration camp in Pinetown to house Boer women and children. A number of German settlers made Pinetown their base and this accounts for the neighbourhood known as New Germany and the German Lutheran Church. Indeed, to this day imported German cakes and goodies pack the shelves at Christmas time in the Knowles Spar, the largest grocery store of Pinetown. One of the largest monasteries was located south of Pinetown in Mariannhill, home to the Mariannhill monastery founded by Abbott Francis Pfanner. The establishment of this monastery had huge influence in the expansion of the Catholic Church in KwaZulu Natal. The area of Clermont was a solely black residential zone during the apartheid era, with land tenure being on a freehold basis unlike the state-owned townships elsewhere in the Durban vicinity. This meant residents enjoyed an atmosphere of freedom and this led to Clermont being a base for some well-known political activists during the apartheid era such as the lawyer Archie Gumede. Other personalities associated with Clermont are relatives of the leader of the world-renowned "Ladysmith Black Mambazo" musical group. No longer a separate municipality, Pinetown is now part of the larger eThekwini Municipality and, for voting purposes, falls within the IEC electoral Ward 18. The area from Cowies Hill in the east, along Josiah Gumede (Old Main) Road/M1 to Westmead industrial area in the west, is commonly referred to as the Pinetown area[according to whom? ]; however, Pinetown extends strictly from Caversham Glen to St Wendolins Ridge. The foundations and structures of the original town can be found at the corner of Josiah Gumede (Old Main) Road and Stapleton Road. Pinetown Cricket Club, established in 1873, is believed to be the oldest cricket club in KwaZulu-Natal and amongst the oldest in South Africa. The club, originally located at the Civic Centre in central Pinetown, has subsequently moved to Lahee Park. Under the chairmanship of former Pinetown mayor Vernon Hall, Lahee Park hosted ten first class games between 1974 and 1979. Former internationals Norman Crookes (twice selected for the Springbok squad) and Tertius Bosch have previously represented the club. Khaya Zondo and Cameron Delport from the 2010 Dolphins team have a close association with the club, as do KZN "B" cricketers Bruce Kruger and Kyle Buckthorp. Comrades Marathon Pinetown is situated on the world-famous Comrades Marathon route which runs along the Old Main Road from Westville, over Cowies Hill past the Civic Centre and on to Fields Hill, and vice versa. This event always attracts hundreds of spectators who line the route every year to catch a glimse of their friends and loved ones in the marathon. Situated in Kings Road, Pinetown, Pine Crest Centre "Sanlam Center" offers 93 stores. One of five campuses of the University of KwaZulu-Natal is in Pinetown, on the corner of Richmond and Mariannhill Roads. The Edgewood campus was originally established in the 1970s as a college to train (mostly white) students as teachers for the apartheid government's schools serving the white community. The purpose-built facilities were superior to other colleges of education where students of other races were trained as teachers. The specialised facilities enabled the training of art, music, drama, science and physical education teachers, and included rooms with overhead viewing platforms for unobtrusive classroom lesson demonstrations. In 2001, as part of the central government's rationalisation of the higher education landscape, the Edgewood College of Education was incorporated into the University of Natal. Then in 2004, with the merger of the Universities of Natal and Durban-Westville to form the University of KwaZulu-Natal, Edgewood became the new University's 5th campus. Edgewood campus is wholly dedicated to the education of teachers and education professionals and is one of the largest producers of new teachers in South Africa. On this campus the University's School of Education offers a four-year full-time Bachelor of Education (B Ed) degree and one-year full-time Post Graduate Certificate in Education (PGCE) for those wanting a teaching qualification. Various other certificates are also offered as in-service training for teachers, as well as Honours, Masters and Doctoral degrees. The library collection is specially equipped to enable those studying education from undergraduate through to doctoral levels. The only Afrikaans-medium school in the area is "Gelofte Skool", whose name translates as "school of the vow" in Afrikaans. It is a combined school i.e. with classes from Grade R (reception year) to Grade 12. 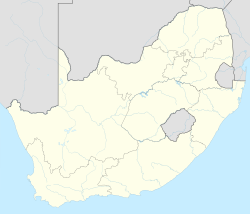 KwaSanti Public Secondary, is a public secondary school located in St Wendolins, Ethekwini Metropolitan Municipality, KwaZulu-Natal Province. Pinetown has a reputation as a "motor town", due to the high number of motor dealerships along Old Main Road. The city has several shopping centres, including Pine Crest and Pine Walk on Kings road, Knowles Spar superstore and St John's Checkers centre. A number of Do It Yourself (DIY) shops are located along Old Main road. ^ a b c d "Main Place Pinetown". Census 2011.